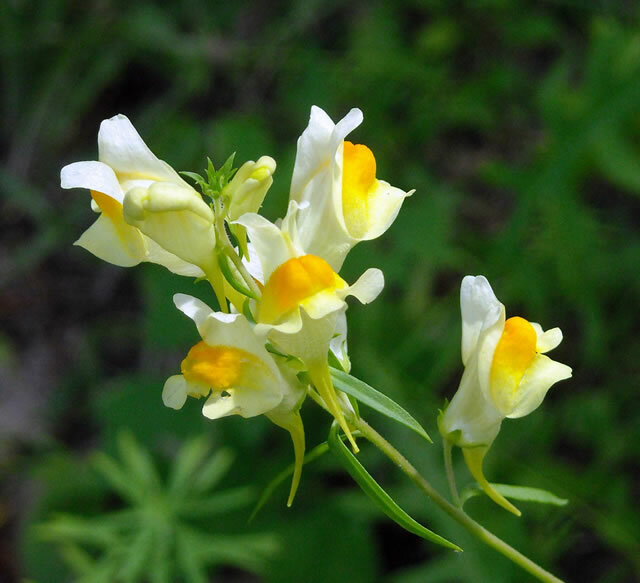 Dalmatian toadflax (Linaria dalmatica) is a short-lived, herbaceous perennial in the figwort family (Scrophulariaceae) that grows up to 4 feet tall. Stems are somewhat woody at the base, and frequently branched in the upper portion. Both leaves and stems are waxy. Leaves are heart-shaped, 1 to 3 inches long and with clasping bases. Flowers are bright yellow with orange markings and elongate spurs and occur in simple racemes on the stems. Flowering occurs from mid-summer to early fall. Seed capsules are ½-inch long pods and bear an average of 140 to 250 small black to brown seeds with wings. Taproots may reach depths of 4 to 10 feet, and lateral roots can extend 12 feet from the parent plant.